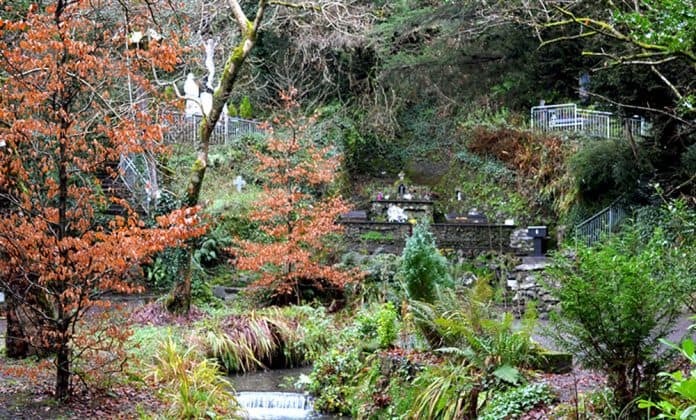 The beautiful serene setting of Tobernalt Holy Well, a place for spiritual contemplation and meditation. Tobernalt Holy Well is one of a number of similar structures that are scattered throughout Ireland’s green and verdant countryside. This well is found a particularly lovely woodland location near the peaceful shores of Lough Gill in beautiful County Sligo. This has been the setting for religious pilgrimage and reflection for centuries. The Holy Well at Tobernalt. The origin of the word ‘Tobernalt’ is not entirely clear. While it is accepted that it is an Irish phrase that has been Anglicized, there is some debate about which particular phrase is the root. Some commentators hold that it comes from the Irish ‘Tobar san Aill’, meaning ‘well in the cliff’. This fits in a geographical sense, as the natural spring that feeds the well descends from the mountain behind it. Another theory fits in with the curative powers that are commonly attributed to the Holy Well. ‘Alt’ refers to a part of the body – thus Tobernalt becomes the well to cure the body. Conversely, others are convinced that that the name derives from the Irish ‘Tobar na nGealt’, which translates as ‘well of the insane’. This viewpoint gains credence when you consider the fact that the close-by Cottage Island was used in medieval times by the Cistercians as an asylum for the insane and for lepers in medieval times. It seems highly likely that those poor souls would have undertaken the crossing of the lake to the Holy Well on the mainland, desperately seeking for a cure. The well existed long before Christianity arrived in Ireland in the fifth century. It was here that the Celts held their harvest festival (Lá Lughnasa). Later, after the festival was inevitably Christianised, it became known as ‘Garland Sunday’ – the last Sunday in the month of July. The practice of visiting the well on Garland Sunday (also known as Bilberry Sunday) has been going on for many years. It is believed that mass was celebrated here frequently during penal times. 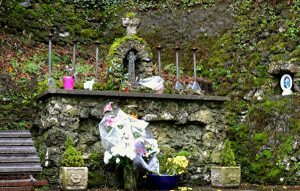 The well at Tobernalt stands out in that it does not bear one of the saints’ names so associated with early Irish Christianity. Although it is often mentioned in the same breath as St. Patrick, it has never officially taken on the name of ‘St. Patrick’s Well’. That being said, this part of Ireland is almost indelibly connected with St. Patrick. We know that the pagan festival, Lughnasa, was celebrated around the area where the well is located. It seems highly likely that St. Patrick followed the pagans in seeing the well as a sacred place and used it to baptise his Christian converts and as a meeting point for worship. Indeed, legend tells that the saint’s fingerprints are visible on one of the stones of the nearby ‘mass rock’. 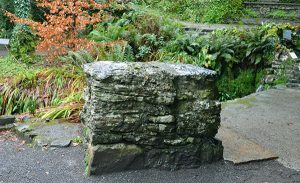 As the name suggests, a mass rock or ‘carraig an aifrinn’ was a rock used in place of an altar in Ireland in around the mid 1600s. It is thought that if a pilgrim places their hands in that same spot, their prayers will be answered. The Altar at Tobernalt Holy Well with the Penal Cross commemorating those restrictive times. As the seventeenth century drew to a close, Catholics were becoming increasingly marginalized and persecuted. At that time, a succession of increasingly harsh ‘Laws in Ireland for the Suppression of Popery’ (more commonly known as ‘penal laws’) were introduced. These were structured in such a way as to discriminate against Catholics in a number of areas. In terms of religion, it was decreed that no priests could be either ordained or educated in Ireland. Each parish could have just one priest and all Catholic monks and bishops were ordered to leave the country. The Mass Rock which was used during Penal Times. 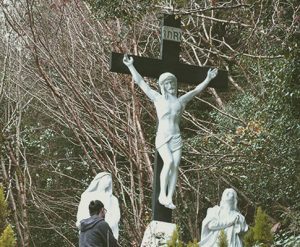 During penal times, despite these harsh laws, faithful Catholics in Ireland at this time continued to worship, albeit in a more improvised way. Chapels continued to be built during this time, though they tended to be in out-of-the-way locations, and by law they could have neither spire nor bell. In reality, the authorities did mostly allow practising Catholics to follow their faith as long as they were not explicit about it. In more rural areas, Catholics would often congregate to hear masses held in the open air by ‘nomadic’ priests. Gatherings of this type would typically take place in a hilltop setting, as it was then easy to situate a lookout who could warn of the approach of soldiers. A large rock took the place of an altar – such as the one near Tobernalt Holy Well. It is thought that many of the traditions associated with Garland Sunday originated from the ancient Mabon tradition, where the dead were honoured in a variety of ways. Garlands made from apples and vines were woven by unmarried women and taken to churchyard, accompanied by any local unmarried men. It is said that an apple fell off a garland as they processed, it was a sign of bad luck as apples symbolized the human soul. Once inside the graveyard, the garlands would be ripped up and scattered over the graves, accompanied by loud wailing and keening. Dancing and feasting would follow, and it was considered a good omen to extend hospitality to any visiting strangers on this particular evening. On occasion, Garland Sunday may also be called ‘Black Crom Sunday‘ (‘Domhnach Chrom Dubh’). Crom Dubh can be translated as ‘the Dark Stooped One’. In ancient times, Crom Dubh was regarded as an evil deity. In stark contrast, Lugh, the Celtic God of the Harvest, was seen as strong and young. It was thought that, each year, Lugh would take the precious spoils of the harvest away from the hands of fate by overcoming the despotic Crom Dubh. 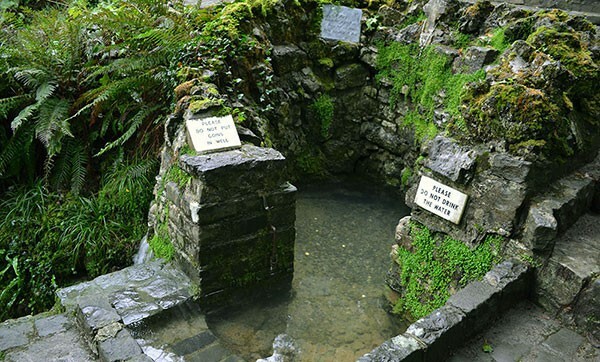 There are a number of Celtic-inspired customs still followed at Tobernalt Holy Well to this day. For example, it is said that that if you are to walk around it, this must be in a clockwise direction. To go anti-clockwise will bring bad luck. In common with many such wells or springs in Ireland, many visitors opt to tie lengths of cloth or ribbon round the nearby trees and bushes, mimicking an ancient healing ritual. Various Holy Shrines around the Tobernalt Holy Well Site. Water was incredibly important in Celtic lore. It was seen as healing, regenerating and purifying. When Christianity was established in the country, and Garland Sunday began to be celebrated, this belief in the power of water was re-directed towards worship of the ‘true’ God – and to this day is used in ritual hand washing, baptisms and other Christian practices. 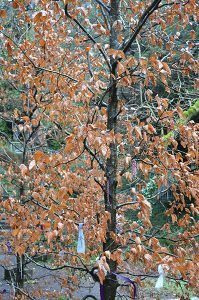 In common with most of Ireland’s ancient holy wells, the water in Tobernalt Holy Well is said to have curative and therapeutic powers. Rather unusually (and very specifically), the waters here are said to boost the skills of footballers! However, it should be noted that there is a sign at the well that warns against drinking the water.